How long dumbbells last in a commercial gym environment vs a home garage gym is a very different thing. In a garage gym we’re talking about the difference between dumbbells that are used by one or two users, and some sizes on the high or low end of a full set perhaps never get touched. On the other hand, in a commercial gym you can count on every dumbbell being used by someone or another, and every one of them is just as likely to get abused, all the way up to the heaviest 100lb or 150lb weights that most people shouldn’t be touching but give it a go anyway. Gym-goers are inconsiderate. That’s the nature of any situation where people use stuff that doesn’t belong to them. Rental cars and motel rooms get trashed 10x quicker than these people’s own cars or homes. That’s why benches and squat racks meant for commercial use are over-engineered. And, by the way, that’s why things get out of hand in the vicinity of the dumbbell rack. Exhibit A. These weights have not yet re-racked themselves. Rubber has problems with all the above and is basically a budget option that helps reduce noise and wear. Urethane is totally the way to go if your gym can afford it. 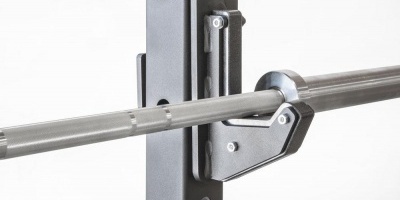 It isn’t really a feature of urethane, but expensive dumbbells naturally have good steel handles that aren’t going to get bent and force you to replace them. People finish their dumbbell bench presses by tossing the weights to either side from full extension. It happens. You want to slap those people, but it happens. The handles of the best dumbbells are super thick to ensure they don’t bend. The Troy and Intek ones we sell graduate up to 34mm thick on the sizes approaching 100lb. This is Rep Fitness’s 100 lb urethane dumbbell. Without some object to indicate the scale of it, it’s hard to see exactly, but clearly this is a thick handle, 34mm to be exact. For comparison, even most power bars aren’t over 30mm, or 32mm at the most for some specialty squat bars. Of course, there are specialty “fat” bars as well, but the point is these handles are thicker than any regular bar you’ll find at the gym. Finally, as these are made to be used in environments possibly catering to advanced lifters, urethane dumbbells often go up to 150lb. Our Troy Premium Urethane Dumbbells go up that high. The other good option for commercial dumbbells is the classic style involving steel handles with weight plates bolted on permanently, which are sometimes called “pro style” dumbbells. There’s something about it that looks great. The style is a throwback, but it still looks professional in modern gyms. Old sets don’t look bad, either. Note: The term “pro-style dumbbells” has been used widely to refer to any model with round heads. York has some they call that, with solid heads (rather than a stack of plates) and rubber coating. The handles come in about 10 different lengths, to fit a specific number of weight plates so that the ends don’t stick out. I should warn you, you will not be able to disassemble Troy’s pro-style dumbbells. They put something like 200 lbs of torque into it with an impact wrench. 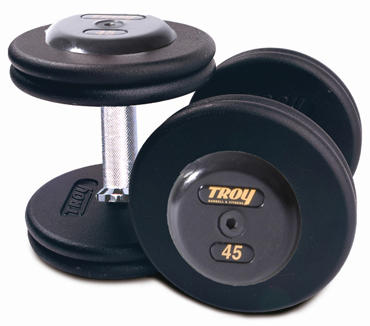 Once I had a customer who was dead-set on taking apart Troy’s pro-style dumbbells to change the amount of weight. He had the tools to do it. Even then, he couldn’t do it. He stripped the bolts. He ended up drilling out the bolts and having to replace the handles, saving only the plates. Wish I saved those pics. That was interesting. Ivanko does the same high-torque assembly with theirs, which Troy’s design is based on. You won’t get them apart. Assembling your own from the right set of handles, plates, and end caps is possible. I’ll tell you right now that you aren’t saving money by buying the pieces new and assembling yourself.